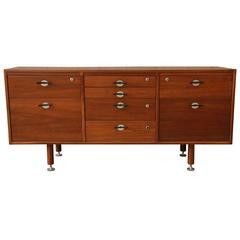 This Jens Risom Long Credenza is no longer available. 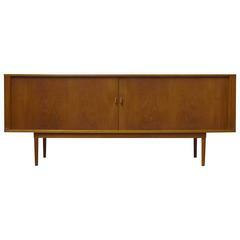 Jens H. Quistgaard tambour door credenza. Top hutch included. 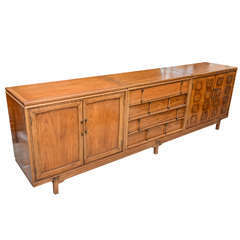 Height of credenza with hutch 58.25. Jens Risom six foot floating bench. Jens Risom expandable walnut serving cart T-580 Features one pull out drawer and a lower glass shelf. Top expands to 60". 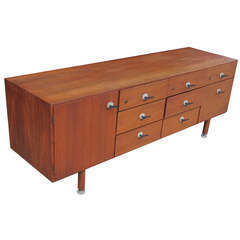 A mid century modern kneehole credenza designed by Jens Risom and made by Jens Risom Design. Two drawers and open shelving. 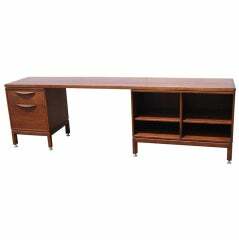 A dark walnut credenza or server with double doors, adjustable shelve and two drawers all having curved satin black pulls. The backside is finished designed in the manner of Jens Risom.